If you are planning on joining in the fun at AE this Saturday, please note that the times have changed! The Arty Garage Sale will be starting at noon, not 7am. Peruse the schedule below for more info. It’s going to be a rip-roarin’ good time. Hey! Don’t go throwing around the name “Zardoz” if there ain’t gonna be no “Zardoz” there! 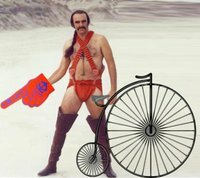 Some of us take “Zardoz” seriously.